Pumpkin Rice Soup With Ginger And Lemon Grass….. This soup is my adaptation of Jamie Oliver’s Pumpkin Rice Laska Soup. I am not crazy about 5 spice powder so I omitted it. I added a little more of this and a little less of that and made it my own. He recommends giving a squeeze of fresh lime juice just before serving, so good! I didn’t happen to have fresh limes at the time. I think that if you topped this soup with a couple of pan seared spicy shrimp it would be over the top! I had leftover spanish rice & whipped butternut squash in my freezer. I also had the pieces of fresh pumpkin that we cut out of our jack-o-lantern’s. I simply cut off the hard rind and cut it into cubes and coated it with olive oil, salt and pepper and roasted it until nicely brown and tender. I would highly recommend running the soup through a blender before adding the rice and cilantro as the ginger and lemon grass can be a bit fibrous. This is what I LOVE about soups. No rules. You can do whatever you like. Save those little bits of rice, pasta, roasted chicken, meat and veggies. Throw them in the freezer and use later for soup. So green, no waste! 1) Chop the squash/pumpkin into 2″ pieces. If you’d like chunks of roasted squash in your soup, chop off a hunk of squash and cut into 1/2″ pieces. (about 2 cups cubed squash) Toss with olive oil and lightly season with salt and pepper. Roast in a 350′ oven for 20-25 minutes or until nicely brown and tender. Set aside. After you clean the cilantro, remove the large stems and coarsely chop. 2) In a large soup pot add a couple of tablespoons of olive oil, jalapeno, garlic, ginger, large cilantro stems and lemon grass. Saute for about 10 minutes over medium heat stirring often. Add the cumin and a pinch or two of salt and pepper. 3) Add the squash and the stock to the pan, lower the heat to low, cover and simmer for 15-20 minutes or until the squash is fork tender. Run the soup through the blender. Be careful not to fill the blender past 2/3 full, hold a towel over the top before you turn the blender on. Once blended add the soup back to the pot. 4) Add the cooked rice and coconut milk. Taste and season with salt and pepper to your taste. Stir in cilantro. Serve immediately. 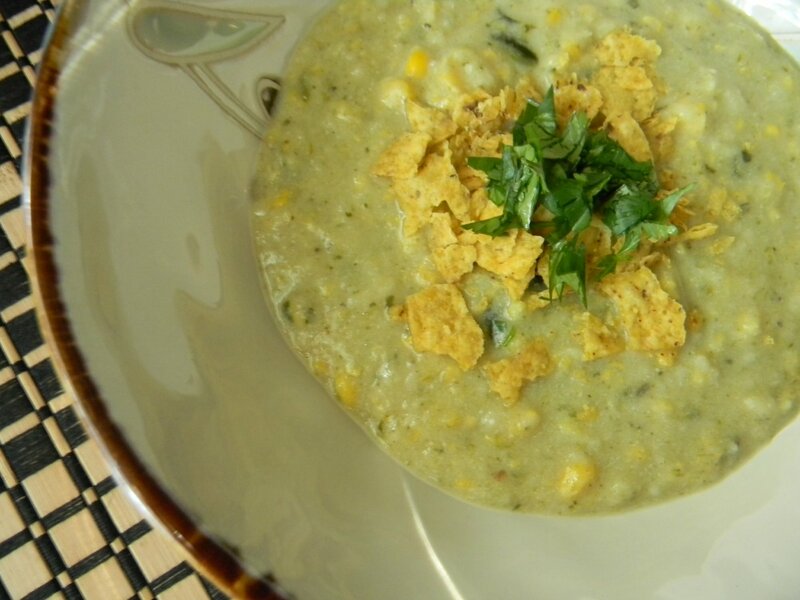 Roasted Poblano, Corn and Tortilla Chowder….. Recently I saw Ina Garten on the Food Channel and she used corn tortillas to thicken a chicken tortilla soup. Brilliant! 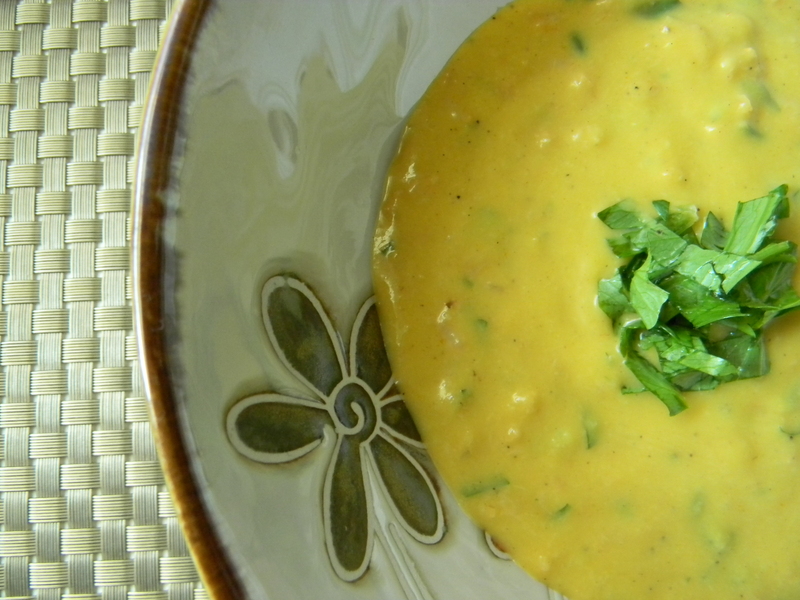 Not to mention the wonderful flavor the tortillas add to the soup. This soup is surprisingly light for how decadent it tastes! Make it vegetarian by using vegetable stock in place of the chicken stock. So good! The first thing you need to do is roast the poblano peppers. This is a very simple process and a very necessary step for flavor in this soup/chowder. 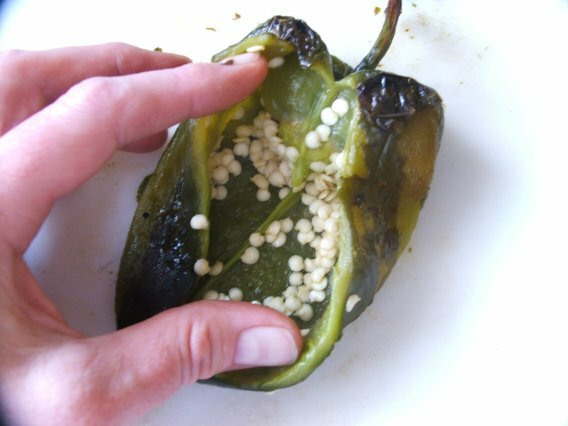 Begin by broiling or grilling the peppers until they get charred and blistered. Remove from heat and put them into a bowl and cover tightly with foil and allow them to steam for about 20 minutes. This will make it easier to remove the skin. Once they’re cool enough to handle, carefully remove the skins from the peppers. 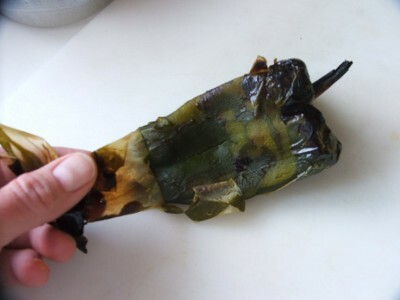 Do not rinse them, you’ll lose the “charred” flavor. Lastly, remove the seeds and membrane. Chop coarsely. They’re ready for the chowder. 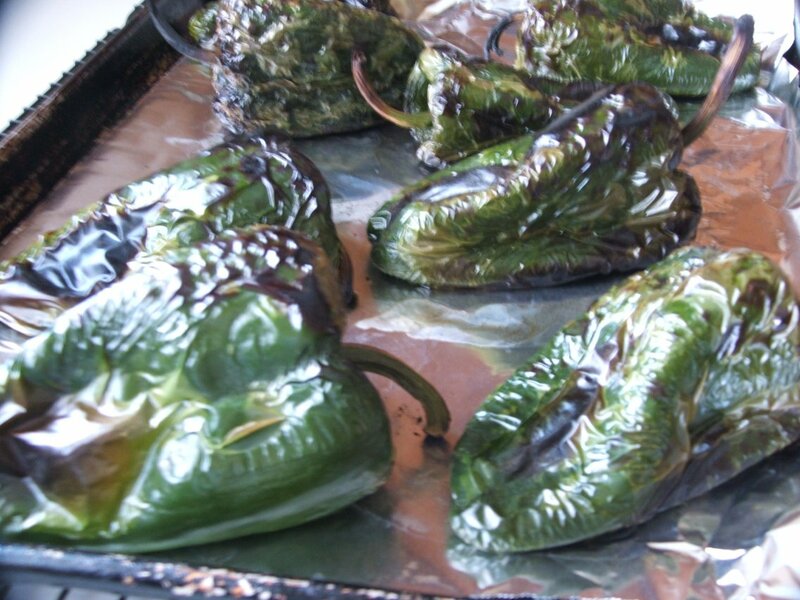 1) Prepare the poblano peppers. Rinse the peppers and place under the broiler in the oven or on a hot grill. Cook until they’re nicely blistered. Put them into a bowl and cover with foil or a lid to steam. This will make the skins easier to remove. When they’re cool enough to handle, remove the skins, seeds and membrane. Coarsely chop and refrigerate until you’re ready to use. 2) In a soup pot, add the olive oil and onions. Cook for 7-10 minutes or until soft. Add the garlic, rosemary, cumin and bay leaf. After about one minute, add the the stock, prepared peppers and corn. Bring to a low simmer for about 20 minutes. Add the milk and bring it up to a simmer again, do not boil. Season with salt and pepper. 3) Add the tortilla strips and stir often until the tortillas have completely dissolved. If you’d like it a little thicker, add additional tortilla. Stir in the lime juice. Garish with crushed crispy tortillas, chopped cilantro and a lime wedge. Makes about 12 one cup servings. I would not have tried this soup had it not been for my friend Amy. She so kindly brought us a batch when Joe got out of the hospital from his recent hip surgery. Let me tell you, it was fantastic! When I first tasted it I thought it had to be loaded with cream as it was so rich and delicious. As it turns out it’s quite healthy! It would made an awesome afternoon snack as it will only cost you 2 Weight Watcher’s points and would count as one vegetable! Serve with grilled cheese for a simple and light supper. 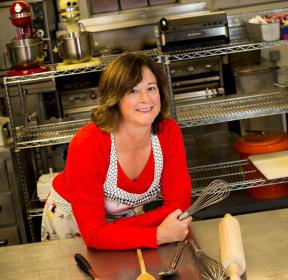 If you’ve read any of my previous posts, you know that I encourage you to “tweek” my recipes and make them your own. After eating this amazing soup, of course, I started thinking of different variations. How about half carrots and half parsnips? How about sweet potatoes? The possibilities are endless! The ingredient list is very simple. 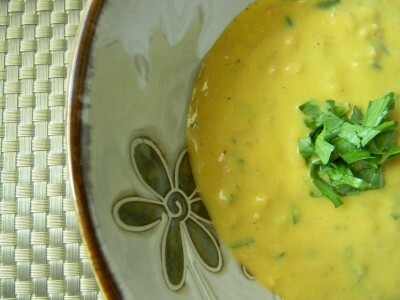 You will need to blend the soup in a blender for the best smooth consistency. Only fill your blender 3/4 full before blending as you can have a “hot” mess in your kitchen if you fill it too high. I would also recommend holding a clean kitchen towel over the top of the blender while the blender is on. 1) Peel and cut carrots into 3/4″ pieces. 2) Melt butter over medium heat in a large soup pot and add onions. Cook until soft, about 7-8 minutes, stir often. 3) Add carrots, broth and salt to taste. I added about 1 teaspoon of kosher salt. Turn up the heat and bring to a boil. Once it’s boiling, reduce heat to medium again and simmer until the carrots are soft, about 20-30 minutes. Remove from heat and add milk and cayenne. 4) Process in blender ins small batches. Serve hot or very cold. *Refrigerate left overs. Makes about 12 one cup servings. Freezes beautifully. If you know anything about me, you know that I waste nothing. You should also know that when it comes to soups or using stock in any recipe, I make my own. That being said, let’s talk turkey. Hopefully you’ve got the entire carcass left in the refrigerator. First pick off as much meat as possible and refrigerate until your soup is ready for it. Check out this post, turkey stock and soup. Great simple instruction on how to deal with the leftover bones and meat. Old Fashioned Chicken Noodle Soup….. The absolute best way to make homemade chicken noodle soup is to start with homemade chicken stock using leftover chicken meat/bones. The next time you make whole roasted chicken, leave a bit of meat on the bones and save the whole carcass. If you don’t plan on making soup within a few days, label, date and freeze. I prefer to accumulate several carcasses in the freezer along with miscellaneous leftover pieces of chicken for soup/stock. Once I have a pretty big stock pile, I make stock. I use what I want for a big pot of soup and then freeze the rest of the stock for later use. There is NOTHING like homemade chicken stock. I enjoy my soup loaded with vegetables and noodles and or rice, almost like a stew. Soup made this way is a meal in itself. Growing up my Mom made soup once a week. She would gather all of the leftovers that accumulated over the week and come up with a delicious and unusual soup. She made the BEST soups! Remember, there are no rules. Add whatever YOU like. I especially like to make stock on days when I’ll be home most of the day. I put it on the stove and allow it to slowly simmer for several hours. Minimum simmering time is about 2 hours but I think the longer it cooks the better it is. If the liquid evaporates 1″ or more, add more water as you go. However long you choose to simmer your stock, your house will smell wonderful! You’ll notice that I do not season the stock. I think it best to season whatever your using it for at the very end. That way over seasoning can be avoided. What to do with that beautiful liquid and all the bones and vegetables? I remove as much of the bones/veggies with a slotted spoon into a large platter. I then strain the rest of the soup through a fine grate colander into a large bowl to remove small bits of skin and bones. If you’d like to take it a step further, you can allow the stock to cool completely in the refrigerator and skim the fat off the top. You would be removing the “schmaltz.” It is actually quite delicious and a very important ingredient in matzo balls….another topic for another time. Most people would remove this to reduce the amount of fat and cholesterol. Many chefs today are using “schmaltz” for cooking as it is loaded with incredible flavor. Allow the bones/meat/skin to cool so that you can handle it. Remove any small bits and pieces of chicken from the bones. Put the chicken in the refrigerator until you’re ready to add it to the stock for soup. 1) Add all ingredients to a large stock pot. Add enough water to submerge all of the stock ingredients. Place pot over low heat and allow it to simmer for 2-4 hours. Add water when it evaporates by an inch. 2) Remove the solid ingredients from the stock with a slotted spoon onto a large platter. Strain the stock through a fine colander into a large bowl. 3) If you’d like to de-fat the stock, pour it into storage containers and allow it to cool a bit on the counter top. Stir often to release heat. Refrigerate until completely chilled. Remove the fat from the top with a spoon. 4) Pick through the bones to remove all of the meat you can. Refrigerate until you’re ready to make soup. 5) If you’re going to make soup, follow the steps below. Remember you can make it your own. Add any leftover vegetables you might have in the refrigerator. My last batch contained leftover roasted sweet potatoes and parsnips and half a bag of frozen peas. 1) Add the chicken stock to a large pot over medium-low heat. Chop up all vegetables and add to the stock. Cover with a lid to get the soup going. Once it begins to simmer, leave the lid on ajar. Simmer for 30-40 minutes or until the vegetables are tender. 2) Time to add all of the goodies. Add the chicken and frozen vegetables if you’re using frozen. Allow to simmer for at least 5 minutes. Add the noodles and whatever other tid bits you may have from your refrigerator. Do not be afraid to add salt to the soup. Remember this is a whole lot of stock/vegetables/chicken. Taste the soup and add it a half a teaspoon at a time, tasting after each addition. Makes 6-8 servings. *Soup freezes beautifully. Simply divvy it up in individual portions or in large tubs. As always, label and date. 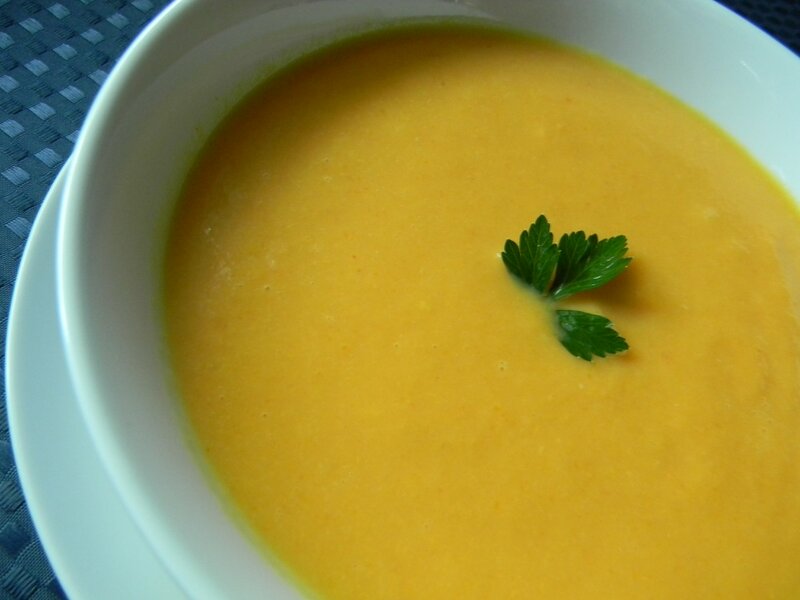 **Try topping your hot soup with a tablespoon of fresh grated parmesan cheese, YUM! ***Cook the noodles BEFORE you add to the soup as the raw pasta will absorb too much of the liquid in the soup. White Bean Soup with Ham Bone…. 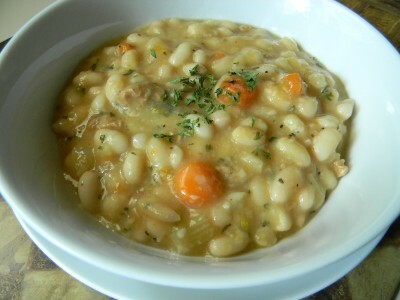 My Grandma Inez always made white bean soup. It was the best tasting soup I can remember. She used ham bones or ham hocks. She was an amazing, old fashioned cook. I loved her and I miss her so much. This is a lovely way to keep her memory alive, isn’t it? I always think of her when I make it. This is my version of her white bean soup. Don’t you love a dish you can just throw together in one pot? When using dried beans, they need to be soaked overnight, rinsed, and drained before cooking. I use a ham bone or you can use a ham hock for flavor, just like Grandma. If you don’t don’t care to use a ham bone or a hock, use chicken stock instead of water for the liquid. Make enough to freeze and enjoy later. First sort the beans to remove any unwanted debris. Soak overnight. Simple put the beans in the pot you’ll be cooking them in and cover with about 3 inches of water. You can see how much they’ve increased in size through re hydrating. This will greatly decrease cooking time. Drain and rinse. Add the onions, celery, carrots, garlic and ham bone…. And finally, add the water. Bring to a simmer and cook for an hour or until the beans are soft. Once the beans are fully cooked, remove the bone from the soup. Cool until you can handle the bone and remove any bits of meat from the bone. Add the meat to the soup and discard the bone. Enjoy with Fresh Sage Cornbread. 1) Add all ingredients to the beans in the soup pot. Over medium heat, bring soup to a simmer. Cook for an hour, stirring occasionally, or until the beans are soft (this will require a taste). Remove the ham bone and pick off any meat and put into the soup, discard the bone. Add parsley. Taste before you season with salt and pepper. Makes eight servings. *note-sometimes dried beans you buy have been on the shelf for awhile. This makes for a much longer cooking time. Be patient. Add additional water and keep cooking until the beans are tender. Simple. Pure. Without msg or ingredients one cannot pronounce. Anything you make with this stock will be SO much better! Use in sauces and gravies. For this use, save the stock in 1-2 cup containers, or- freeze in ice cube trays and when they’re fully frozen, empty them into a large zip freezer bag, take out what you need, even the smallest amount. For all Moms and Dads out there, I give this to my guys when they have stomach issues associated with the stomach flu. I believe it is very medicinal. For the chicken stock, you will need chicken bones. If you on occasion enjoy a rotisserie chicken, save the carcass. Simply put into a freezer bag, label and date for future use. I have a stock pile of miscellaneous chicken parts. I seldom through chicken bones in the garbage. 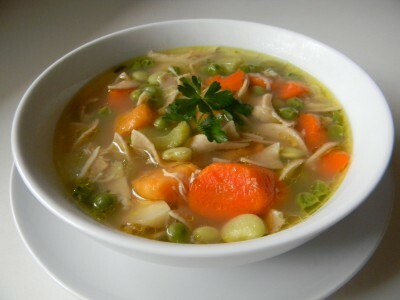 (only after stock do they go in the garbage) Save small amounts of chicken you do not use, they make great chicken noodle soup. ﻿If your chicken carcass is frozen, no worries, just plop it in the pot. (note-the more bones the more flavorful your stock will be) Cover with water and add a whole cut up carrot, a celery stalk cut into pieces, and 1/4 of an onion. Use a nice bunch of fresh parsley if yo have it. That’s it. No need to salt, season when you use in your recipe. I realize this doesn’t look very glamourous, just wait:-) Put the pot over low heat, uncovered. Do not allow this to come to a boil as it will result in cloudy stock. Simmer over low heat for 3-4 hours. I hope this doesn’t seem daunting, you don’t have to do much with it. Add water when you see that it’s cooked down an inch or so. Using a slotted spoon, remove as much of the bones and vegetables as possible. Place a fine strainer over a bowl and carefully pour or ladel the stock into the bowl through the strainer. There you have it. This batch made about 16 cups of stock, or 4 quarts. This will make a very nice base for a couple of homemade soups. Use now or freeze for a later date. Remember to label and date! After all the blustering about homemade stocks this one calls for water. I love the simplicity of this soup. Ready in only about 60 minutes. Vegetarian, delicious, simple, flavorful. Add any miscellaneous veggies you have hanging around in the refrigerator. Feel free to add leftover rice or barley. First and foremost, you have to sort through the dried lentils. You will find a few not so pretty ones but also be looking for small debris like stones. Rinse well. Next finely chop 1/2 cup each celery, carrots, and onion. Add to your heavy soup pot over medium heat with a couple of tablespoons of olive oil. Saute for about 10 minutes. Add 4 large cloves of minced garlic and cook another minute. Veggies should look like this…. Add the water, salt, and pepper, and begin to simmer over medium heat. The lentils should cook in about 30-40 minutes. Once the lentils are soft, put the chick peas, lemon juice, water, and parsley into a food processor and process until smooth. Enjoy with crusty french bread or corn muffins (recipe below). YUMMY! 1) Heat a heavy and large soup pot over medium heat. Add olive oil. Add celery, carrot, and onion. Sauté for about 10 minutes or until vegetables are soft. Add garlic and cook another minute. 2) Add water, curry powder, and rinsed lentils. Simmer for 35-45 minutes or until lentils are soft. If the water is getting low, add a cup at a time. You want it to be more stew-like. Taste the lentils after about 30 minutes of cooking for doneness. 3) Put the chick peas, lemon juice, ¼ cup water, and parsley into food processor. Process until smooth. Add to the soup when the lentils are done. Serves 8. *If you do not have a food processor, add a cup of prepared hummus. *If you don’t care for curry, simply omit. Gee, anyone sick of being cold? In addition to the cold, sick of being sick? It seems that every time I turn around, someone in the house is sick. The perfect remedy? Soup. The ultimate comfort food when you’re sick or healthy. Piping hot and loaded with goodness. With or without meat, you choose. In the next couple of weeks I’ll be sharing some of my favorite soup recipes. In addition, what’s soup without a yummy bread side. How about cheddar corn muffins? Or an old fashioned buttermilk biscuit? Have you been saving your chicken bones/carcasses? There is absolutely NOTHING like making your own chicken soup base. All you need is a carrot, a stalk of celery, a half an onion, and water. (and chicken bones, of course) The longer you simmer the better. If the water gets low, simply add more. I simmer this concoction for about 4 hours. Remove the large bones with a slotted spoon. I strain stock through a sieve to insure that there are no bones or skin left in the stock. Vegetable stock is equally as simple. Stash all those asparagus ends you don’t use, broccoli stems, or any fresh vegetables you can’t use in a timely manner in the freezer. Dump it all in a pot and cover with water. Again, add some onion, celery, and carrot. Simmer for a minimum of 2 hours, do not allow to boil. If you enjoy rotisserie chicken on occasion, save that carcass. As always, label and date what you put into the freezer. If you’ve got a few pieces of chicken leftover from a dinner, freeze them, they’ll work too.